Camille Pissarro’s drawings are a difficult means to define the artist. A conservative estimate puts their number at over three thousand[i], with the majority of his drawings executed in his later life and mostly undated. Compared to his contemporaries Pissarro made twice as many drawings as Cézanne and four times as many as Manet. Further complicating the matter is a stubborn adherence to the myth that Pissarro was a self-taught artist. Fortunately, a surprising number of drawings are related to paintings, distinctly made as either presentation works or sketches giving the art historian somewhat of a touchstone. The work under investigation, View of Trees, is a sketch made in 1859, resulting from a period of great change for the young artist representing the gestation of early seclusion, his immersion into the vast artistic variety of mid-century France and the birth of his political beliefs. Born in 1830 to a Portuguese Jewish family on the island of St. Thomas, Camille Pissarro first came to France at the age of twelve for schooling. Residing in the suburbs of Paris and attending the Pension Savary, he gained a small amount of artistic instruction. His family’s dry goods and haberdashery interests in the Caribbean provided the funding for Pissarro’s education. Upon graduation, Pissarro left France, avoiding the Revolution of 1848. But he returned to St. Thomas to an equally tumultuous situation with the slaves of neighboring St. Croix rebelling, beginning the eventual emancipation of the Caribbean. This event was highly significant to the young artist and began his life-long devotion to freedom[ii]. Within four years of work, Pissarro would act on this devotion, pursuing art full-time. Pissarro’s early twenties was a time of self-imposed isolation, spending 1852-53 in Caracas, Venezuela and 1854-55 in St. Thomas. Definitively cutting himself out of financial stability he would later write of the decision “I abandoned all I had there and fled to Caracas, thus breaking the bonds that tied me to bourgeois life.”[iii] This decision to pursue art inaugurated an intensified period of study to meet this challenge. Because of the limited influences available to Pissarro the Caracas works have a stylistic unity. Only his teacher Fritz Melbye, a successful painter of marine subjects, and possibly the drawing manuals of Samuel Proust were immediately on-hand. Despite this Pissarro developed quickly and the drawings made two years later, after his return to St. Thomas, are very different in character and suggest a much more sophisticated sense of composition[iv]. Pissarro’s return to France in 1855 and his subsequent move to Paris later that year opened a wealth of artistic possibilities for him. Initially this vast array of stimuli overwhelmed Pissarro turning him not into a young master but rather a pupil of many masters[v]. Pissarro studied at the École des Beaux-Arts with academic teachers Lehman, Picot, and Dagnin. Among the artists he met beginning in 1857, were Corot, who encouraged Pissarro to pursue open-air painting, Chintreuil, Daubigny, and eventually Courbet. In 1858 he met Monet and sketched live models at the Swiss Academy. In this formative period came View of Trees a work that does not look much like the Pissarro we know today. The closest stylistic comparisons are the landscape drawings of Corot from the 1830s. Pissarro had purchased just such a Corot drawing, dating from 1836, in 1858 and viewed the artist with great admiration. View of Trees is executed in pen over pencil and the cut edge indicates that it came from a sketchpad. The barge in the upper left is entirely composed of pencil and appears to have been abandoned in favor of the grove of trees in the center left of the page. The area depicted is that of La Roche-Guyon and was probably done outdoors. This belief is reinforced by the inking of the drawing, completed in his studio, which omits several branches and trees in a reinvention of the natural composition Pissarro worked from. The tree on the far right terminates with only the stump receiving ink leaving the rest of the trunk and foliage unfinished. 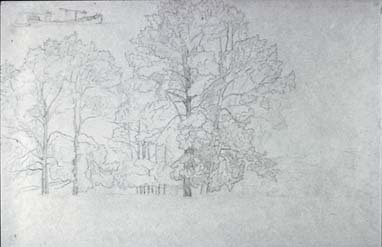 Similarly, various branches throughout the grove and the horizon line are omitted from this second stage of the drawing. The pen is employed in a schematic manner and does not conform to a naturalistic depiction. Cross-hatching is mainly used for indications of shade, with very little complementing the contours of the trees. Though there are moments of levity in some of the looser descriptive marks, the overall control of the artist’s hand makes the drawing rather rigid. The focus of detail gives a heightened sense of immediacy, in that the closer the object is the greater the detail appears. Pissarro renders an exact replica of his perception in the drawing, rather than provide a traditional recessional illusion. The strong composition of View of Trees relates to an earlier drawing from the same sketchbook, also in the Ashmolean collection (Pissarro 52). However, unlike View of Trees, it is loosely sketched with heavy shading and paint-by-number indications. There is a possibility that the two were to be used in conjunction for an aborted painting project. Pissarro 52 acting as an experiment in shading while the schema of View of Trees, with its highly delineated forms, was meant for easier translation of the image to canvas. Such a detailed preparation would conform to the tightly structured, carefully planned landscapes Pissarro made in the late 1850s/early 1860s. [vi] However without a specific painting relating to these drawings the viewer can only guess at their purpose. Perhaps this is for the best, because the viewer is thus given the opportunity to glance at a style not pursued by the young impressionable artist, a decision that would eventually lead to Pissarro becoming Pissarro.